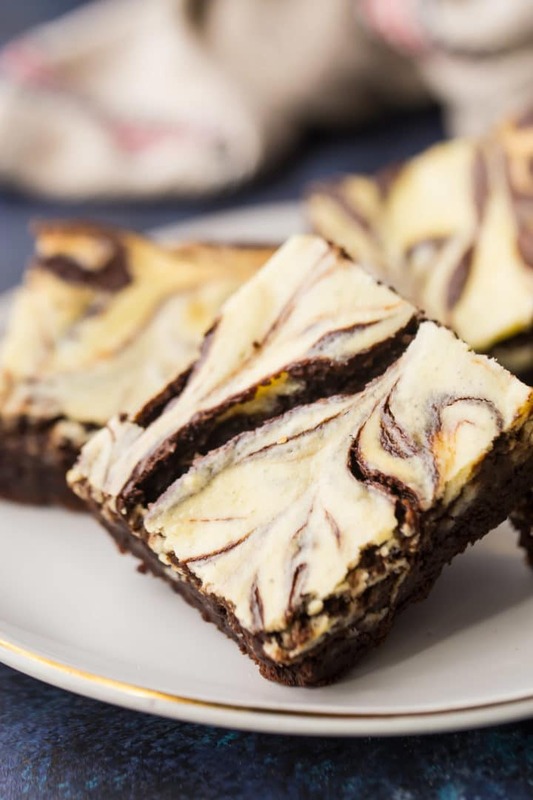 These marbled cheesecake brownies are a total crowd pleaser! The combination of rich, fudgy chocolate and tangy cream cheese just can’t miss! Cheesecake brownies. Dude. Am I right or am I right? Two of the best things ever, combined into one glorious bar! There are a lot of brownie recipes on this site. We’ve done peanut butter brownies, junk food brownies topped with pretzels, potato chips, and caramel, and even made a double chocolate cheesecake on a brownie crust. All of these fabulous recipes were based upon the same easy recipe for brownies from scratch. It’s the best! And today we’ve made it into marbled cheesecake brownies. Swoon! I can’t think of anything that contrasts more perfectly with a rich, fudgy chocolate brownie than cool, creamy cheesecake. These cheesecake brownies will be a huge hit at your next get-together! 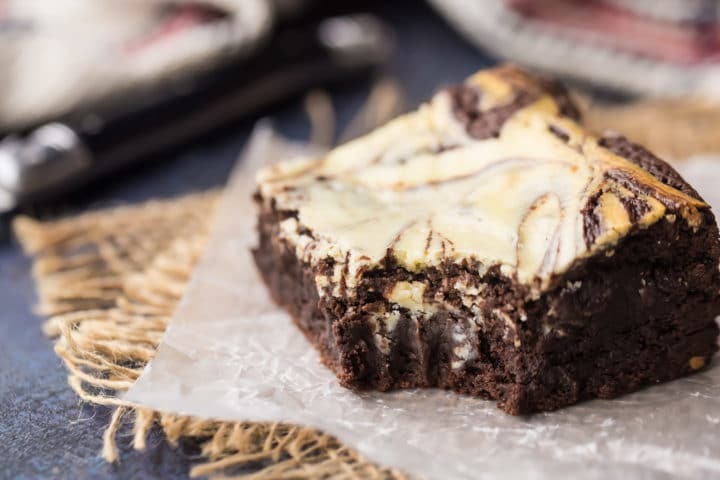 These cream cheese swirl brownies are so easy to make from scratch! You’ll never go back to boxed mixes again, when you see how easy this recipe is. And the rich, dark chocolate flavor and fudgy texture will blow you away. There are 2 basic components to this recipe: the brownies and the cheesecake. Start with the brownies. It’s as simple as whisking sugar, melted butter, cocoa powder, and vanilla extract together. (You want to look for regular, unsweetened cocoa powder.) Once those 4 ingredients are combined, mix in the eggs until smooth. Then fold in the flour, baking powder, and salt. That’s it! You just made brownie batter from scratch! For the cheesecake swirl, just blend cream cheese, sugar, an egg, and a dash of vanilla together until smooth. Then drop the batter by spoonfuls all over the top of the brownie batter. Use the tip of a knife to create a cool marbled effect, and into the oven they go! These brownies will bake for anywhere from 45 minutes to an hour. The toothpick test won’t really work for this recipe because the brownies are so fudgy, but you’ll know they’re done when they’re set around the edges and still just a little soft towards the center. Definitely allow the cheesecake brownies to cool completely before removing them from the pan and slicing them into bars. They are extremely tender when they’re still warm, and they will probably just fall apart on you! I like to bake them the day before serving, so they have plenty of time to firm up. 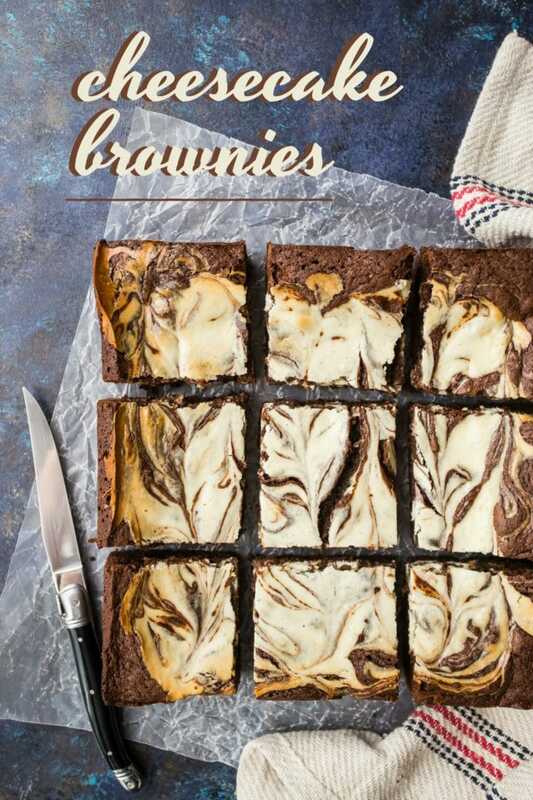 Can Cheesecake Swirl Brownies be made ahead? I would definitely recommend baking these marbled cheesecake brownies ahead if you can. If they have overnight (or at least 2 hours) to chill they will slice up much more cleanly for you. To get really neat, pretty edges, use a sharp knife (I really love this kind) and push it straight down, as opposed to sawing back and forth. If there are a lot of gooey crumbs clinging to the blade, take a moment to clean the knife in between each cut. I know it’s a bit tedious, but if you want beautiful cuts that’s really the best way to get them! These cheesecake brownies can be kept at room temperature for a day or two. After that point, they should probably be stashed in the fridge or freezer. Wrap them tightly so they don’t dry out. They’ll keep for about a week in the fridge; a month or two in the freezer. 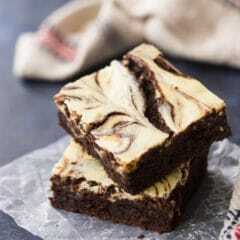 Give these marbled cheesecake brownies a try! They’re so simple to make and I promise you won’t be sorry! These marbled cheesecake brownies are a total crowd pleaser! The combination of rich, fudgy chocolate and tangy cream cheese just can't miss! Mist a 9x9-inch pan* with non-stick spray, and line with parchment. Place the sugar, melted butter, cocoa, and vanilla in a large bowl and whisk until smooth. Mix in the eggs until fully incorporated. Fold in the flour, baking powder, and salt, and transfer the batter to the prepared pan. Place the cream cheese, sugar, egg, and vanilla in a medium bowl and mix until smooth. Drop dollops of the cheesecake mixture over the unbaked brownies, and swirl with the tip of a knife. Bake for 45 minutes to 1 hour, or until the cheesecake brownies are set around the edges but still a little soft towards the center. *This recipe can also be baked in a 9x13-inch pan. The brownies will come out a little thinner, and the bake time may need to be adjusted. I love plain ol’ fudgy brownies, but adding a swirl of cheesecake makes them even better! This looks so heavenly! My sweet tooth is definitely calling out for this recipe! Two favorites in one glorious dessert! Sign me up! You can never go wrong with this kind of flavor combination! I just made my own recipe a few weeks ago….these were a favorite growing up! I love your version, too….so tender and fudgie! I just baked these last night. Amazing recipe! Delicious and easy. 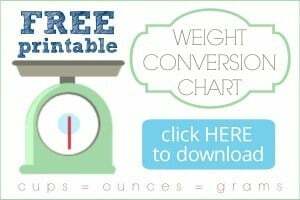 With all that cocoa powder and butter, it’s hardly economical, but its totally worth it. If you don’t like a fudgy brownie, you can add a few tablespoons of water to the batter. I added 1/4 cup of and they turned out fine. 5 stars! Great to know about the water! That’s an excellent tip. And yes they are heavy on the cocoa and butter- definitely a splurge in more ways than one! So happy you enjoyed- thanks for the great review!